which we affectionately call "The Mountain". We pray that as you browse through our website that your spirit will be pricked with the love that resides here. I encourage you, that if you have not excepted Jesus as Lord and Savior of your life, to take the challenge and allow God to transform your life into something beautiful and pleasing in his sight. Your one true goal in life is to serve and please God. You want to be able to see him in peace and hear him say well done thy good and faithful servant. We invite you to visit the "Mountain" at 1916 Fulton Street in the Bedford-Stuyvesant section of Brooklyn. Prepare your heart and mind for a "Mountain" experience where the Spirit of the Lord flows freely and we recognize that "Holiness is Still Right". For the bible says, "Holiness, without which no man shall see the Lord"-Hebrews 12:14b. 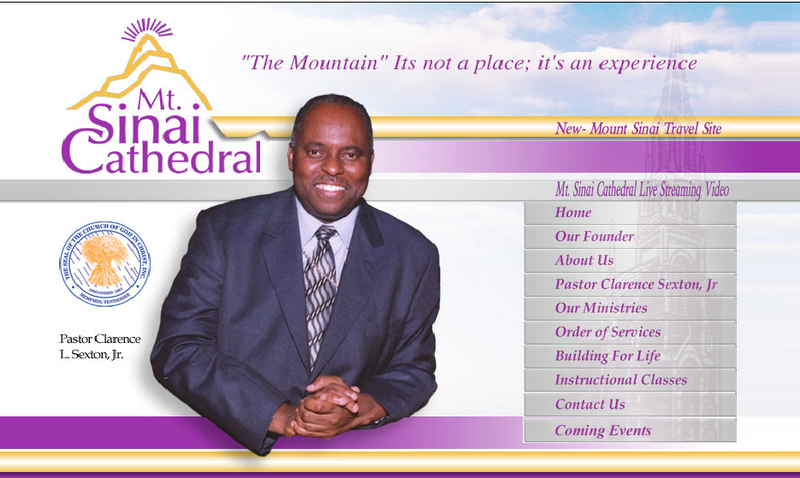 You are invited to come worship and praise the Lord with the Mount Sinai Cathedral Family. Be encouraged and I command you to be blessed in the Lord. It is so, and so shall it be. Pastor Clarence L. Sexton, Jr.